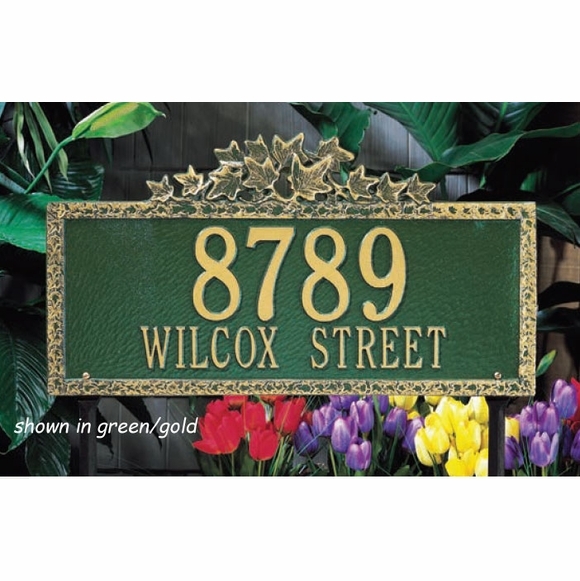 Rectangle Address Plaque with Ivy Border - - wall mount or lawn mount custom made address sign with either one or two lines of personalization. Two sizes: 16.5"" x 9.75" and 23.5" x 12.75". Made in America. Lawn mount signs come with two 18" lawn stakes. The one-line 16.5" x 9.75" sign holds up to five (5) 4.5" numbers or seventeen (17) 2" characters. The two-line 16.5" x 9.75" sign holds up to five (5) 4.5" numbers on Line 1 and up to seventeen (17) 2" characters on Line 2. The one-line 23.5" x 12.75" sign holds up to five (5) 4.5" characters or seventeen (17) 2" characters on Line 1. The two-line 23.5" x 12.75" sign holds up to five (5) 4.5" characters on Line 1 and up to seventeen (17) 2" characters on Line 2. Dimensions: 16" x 8" and 25" x 12". Rectangle Address Plaque with Ivy Border wall mount or lawn mount custom made address sign with either one or two lines of personalization. Two sizes: 16.8" x 8" and 25" x 12". Crafted from rust-free recycled aluminum. Made in America.